Yes, I live. I can cross the streets asking "What year is it?" I remember a flower floating on water. What do I call it? White blossom swimming in place? Brother holding brother? To staunch bleeding apply gauze and pressure, then bandage. like fine doilies. Where red tide meets blue, sister caressing sister. can I tell you? That it didn't bother me? There was no time to think? without vowels. Arm without "a." Leg without "e." And head. How do I say head? The Cloud View Poets anthology contains one poem by each of the poets who have attended David St. John's Northern California workshops, which started in 2001. Up to date, 5/2011, there have been over 100 weekend workshops. These 81 poets gather, 15 at a time, in ‘Lyn Follett’s living room on Cloud View Road to discuss poetry written by the masters and to offer their own work for group critiques. The anthology is capacious in the range of voices, forms and subjects it embraces. The poets are joined together by the idea that the reading and writing of poetry is a serious endeavor. They have published widely and accumulated numerous prizes and honors. Many teach poetry in universities, colleges, schools, prisons, and private workshops. All share a belief in the power of poetry! 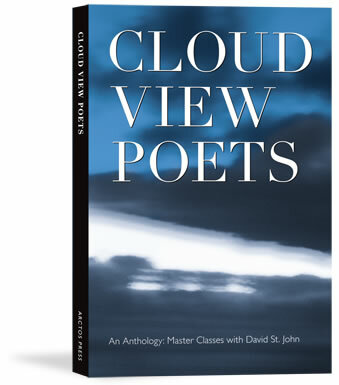 Cloud View Poets is more than a collection of accomplished poems. It is also a way to preserve those weekends spent learning about poetry from a distinguished poet and gifted teacher who navigates the diversity of the group with intelligence, passion and respect for the writing.